In case you hadn’t noticed, there’s a Catholic construction boom underway in Billings. The new St. Francis School at Colton Boulevard and Woody Drive, which will serve K-8 students and is expected to open next fall, has an $18 million price tag. Just west of the new school, St. Thomas the Apostle Catholic Church is nearing completion of an expansion project priced at $4.5 million. The combined value of the two projects—$22.5 million—is more than a quarter of the value of all commercial construction in the city of Billings in 2016. The city’s finance division, in its annual financial report, pegged commercial construction at just under $80 million last year. 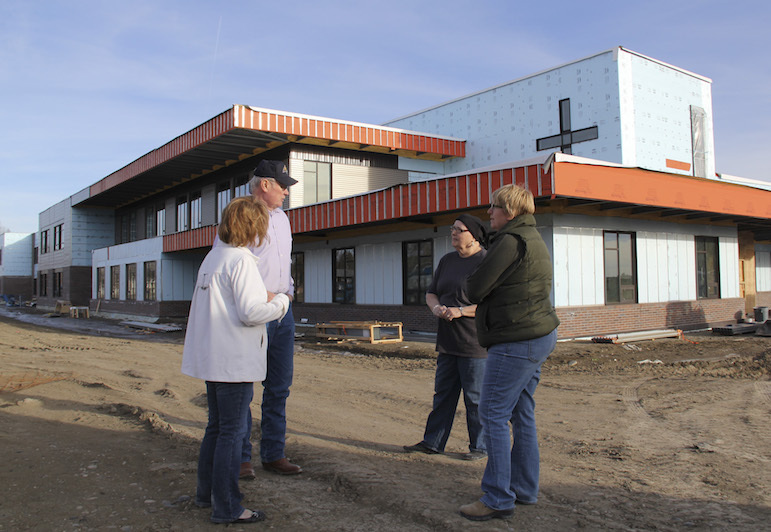 The total value of construction by the Catholic community of Billings is even greater if you include Mary Queen of Peace Parish, which has broken ground for a new church on South 27th Street. That project has a price tag of $3.1 million, but for now only site improvements are being done. Construction of the church won’t begin until more funds are raised. And it’s not as though the larger Catholic Church—either in Rome or in the Diocese of Great Falls-Billings—has a pot of money to fund such projects. St. Thomas and Mary Queen of Peace had to turn to their own parishes for the money. To build the new St. Francis School, the Billings Catholic Schools Foundation had to raise all the money locally. The big investment is even more impressive if you consider that the Catholic Church has been shrinking nationally. Though the number of parish-connected Catholics has risen some in recent years, they represent a smaller proportion of the overall population. The Pew Research Center reported that Catholics made up 20.8 percent of the U.S. population in 2014, down from 23.9 percent in 2007. And in the Diocese of Great Falls-Billings, according to diocesan Chancellor Darren Eultgen, the number of Catholics has dropped in the past 10 years from 45,000 to 38,000. But much of that drop, he said, reflects population declines in rural communities. Though he had no numbers for Billings, Eultgen said the church has grown here in the past 10 years. That is certainly the case at St. Thomas. In the past six years, said the Rev. Steve Zabrocki, the parish priest, the church has gone from half full on Sundays to 90 percent full, and on special days like Christmas and Easter, the church is standing room only. “We were being called to do something here,” he said of the expansion project, which will add 8,000 square feet to the church and attached buildings, adding more than 100 permanent seats to the worship area and greatly expanding the church’s community center. Different factors drove the decision to combine all K-8 classrooms into one new building. In recent years the Catholic school system has had to turn away some prospective students because there was no room for them in the aging complex of three separate schools spread out between the downtown and 19th Street West. Though land for a new school at Colton and Woody had been donated way back in 1959, several attempts to start the process of building a new school sputtered and came to nothing over the years. That finally changed after a feasibility study was completed in 2011 and a fundraising campaign was launched in 2012, said Janyce Haider, president of the foundation. “We had a real need and people finally said, ‘OK, let’s get this done,’” she said. Eultgen said that while it is unusual to see so much construction activity in one city, it had less to do with a big surge in numbers than a coincidence of timing involving three separate projects arising from separate needs. By any measure, though, this is an important moment in the history of the Catholic Church in Billings. Here’s a look at all three construction projects. To date, the Billings Catholic School Foundation has raised about $15 million toward the $18 million cost of the new school. Haider said the original plan was to put off completing the school’s gym and locker rooms until all the money was raised. But the foundation decided it didn’t make any sense to open an unfinished school, so the foundation turned to the diocese for a construction loan to complete the project. If fundraising falls short, some portion of that could become a permanent loan. Besides replacing antiquated schools, Haider said, the biggest benefit of the new school will be to consolidate elementary classrooms in one building. Plans call for selling St. Francis Primary and St. Francis Upper School and converting St. Francis Intermediate School into an early childhood educational center. Next fall, Haider said, there will finally be no more “St. Francis shuffle,” which is what they call the process of delivering and fetching children, in the case of some families, to and from all three schools. “There’s a lot of parents who’ve done that, so that will be a big relief,” Haider said. The new St. Francis will have 90,000 square feet on two floors, with four classrooms for each grade level. With 20 kids in each classroom, that would mean room for 720 students. But state standards allow up to 30 students in each classroom for grades 5-8, which would increase capacity to 840. Each grade will have its own “neighborhood,” with classrooms grouped around a common space that can be used for group activities or expanded classrooms, and each classroom will have a sink and drinking fountain. The new school will have four special education teachers, with resource rooms set aside for special-needs instruction or accelerated learning. There will also be two science rooms, a computer lab, art room and library. The cafeteria-commons will be on the ground floor just inside the main entrance on the west side of the building. The gymnasium will have 500 bleacher seats with room for another 200 spectators on the floor, and the locker room will have a separate area for use by high school football players, who will continue to use the practice football field just south of the new school. Near the cafeteria will be a small chapel that is intended to be, in Haider’s words, “the heart of the school.” The school will also have a state-of-the-art playground, funded through a grant from the E.L. Wiegand Foundation. Haider said those individual donors, almost all of whom live in Billings, also support the public schools through property tax levies. Zabrocki, the parish priest, said the expansion project at St. Thomas is needed to expand the worship space and community room and to bring the scattered staff together in a single, secure area. More than 70 percent of parishioners approved of plans to pursue the expansion, he said, and 70 volunteers worked with a consulting firm on the capital campaign, which brought in about $3.6 million. The parish also had some money in savings, and the fundraising continues. St. Thomas has about 1,200 families in its parish, Zabrocki said, for a total of about 3,600 people. The St. Thomas expansion will add 8,000 square feet to the parish building, including 120 permanent seats in the worship area, which now seats 500, and another 100 temporary seats in the gathering space at the rear of the church. There will also be a new grand entrance, on the north side of the building, with stained glass panels along its whole front. A new music room is being built in the basement, beneath the addition that will be the gathering space for the worship area. The cramped community room and kitchen will become part of the new administrative center, and the old gymnasium, on the west side of the church, will become the new community room with its own, expanded kitchen. The community center will have folding walls to make three smaller rooms, one of which could still be used as a gym for younger children, or one large room for special events and gatherings. St. Thomas will be sharing some of its parking space with St. Francis School and it will also add some new parking spaces closer to the church itself. Separately from the church expansion, the Catholic community is trying to raise $320,000 to build a small Perpetual Eucharistic Adoration Chapel just south of St. Thomas Church, to be available as a place of prayer 24 hours a day, seven days a week. This new parish was founded in 2012 as a consolidation of three former churches on the South Side of Billings. Our Lady of Guadalupe and Holy Rosary churches were closed and Little Flower Church became Mary Queen of Peace. The parish purchased land on South 27th Street between 10th and 11th avenues south as the future site of a new parish church, and it received a $150,000 donation to do the site preparation work that is underway now. That involves leveling and grading and installing curbs, gutters and sidewalks. A couple of years ago, the hope was to raise $4.5 million to build a new parish church, a community center and office space. The plan now is to raise $3.1 million and build just the church and a parking lot, then to expand as future fundraising allows. The parish hopes to raise about $2 million through the sale of the three closed churches, and it has about $500,000 in a campaign fund, some of it left over from an earlier capital campaign and some from later donations. The site work should be done by the middle of this year, Lowe said, after which the parish will start pushing toward the $3.1 million target. Mary Queen of Peace Parish has about 575 families, Lowe said, and some families have drifted to St. Thomas or St. Pius parish as the South Side churches closed. That means it could be used by tourists and travelers and by people who live on the outskirts of Billings and don’t have a parish of their own. It will also be located near the Montana Women’s Prison and Passages, a correctional facility, and in an area of town where homeless people tend to congregate. So it’s going to be an active church with lots of outreach, Lowe said, a church that lives the Gospel message of helping people most in need. “As Father Jose likes to say, we don’t want a museum over there on 27th,” Lowe said.